Of all the many phenomena alleged to have occurred at Borley Rectory, from the time it was built in 1863 through to its destruction by fire in February 1939 & eventual demolition in the mid 1940s, one to which several theories have been applied which suggest natural & somewhat mundane explanations to the reported happenings is the occurrence of lights seen in certain windows of the building during periods when the premises were occupied as well as when the Rectory was empty & tenantless. When compared to the more spectacular happenings which have been chronicled at Borley, such as the violent poltergeist outbreaks of the Foyster tenancy or the sightings of the apparition of the ghost nun during the times of the Bulls, the odd report of lighted windows in the Rectory seems one that can be quite easily dismissed as something to which a normal explanation can be readily applied. With the Rectory now gone any examination or re-examination of alleged incidents can only be limited to theoretical exercises & the case of the lighted windows is no exception. Having said this, and despite the fact that the explanations which have been given – and there are several – all seem plausible, if this particular phenomenon & its mundane causes are looked at in more detail, it becomes clear that none of the explanations are clear cut or definite & it could be that the sighting of lights in certain windows of the Rectory are not that easy to explain away. Back in November 2003, Eddie Brazil contacted me with the suggestion that we get together at Borley to see if it was possible to say for certain whether one of the explanations for the lighted windows can be justified, that is that the lights reported at the Rectory were caused by reflections from passing trains on the then nearby railway line between Sudbury & Long Melford. This explanation has been current for many years & the authors of the 1956 critique of Borley use it as a likely explanation as to how at least one particular window of the building was seen to be illuminated when on investigation the room was found not to have been in use at the time. Indeed, the authors of The Haunting of Borley Rectory reproduced a copy of an Ordnance Survey map of the locale in their report to emphasize the fact that as far as they were concerned, passing trains were the solution to this particular Borley mystery. Eddie felt that in order to get an idea as to how solid this explanation was it was essential to actually go to Borley & get to grips on site with the distances involved between the sites of both the former building & the course of the old railway line. I agreed that it would be a good idea to concentrate on this particular aspect of the Rectory haunting & felt that a field trip coupled with a detailed look at the written evidence of the phenomenon from the various Borley books would allow other Borley enthusiasts to look afresh at this particular phenomenon. A visit to Borley took place on 7th December 2003 although unfortunately Eddie was unable to accompany me at the last moment. The results of my trip & examination of the Borley literature together with both our comments & conclusions are presented below. This, the first part of our joint essay, concentrates on the way that the lights at the Rectory have been reported in the published Borley books & what can be gleaned about them from this. The various explanations to the phenomenon are given & commented on & the topography of the Rectory & its surroundings are examined with particular reference to the passing trains’ theory. A second part will look more closely at the operation of the Sudbury to Long Melford railway & the relevance of this to the reports of the lights at Borley Rectory. If only the lights reported at Borley could be explained away as easily as the mysterious illuminations which were seen in the night sky one evening over Guildford in Surrey in the late 1990s. The bizarre column of light seen above the town from several miles away wasn’t a stairway to Heaven or evidence of extra-terrestrial activity but an air-raid-style searchlight rigged up without planning permission as a publicity stunt on the roof of a local nightclub! In the middle of a busy town with plenty of witnesses the mystery was soon cleared up, but at remote & rural Borley explanations weren’t so forthcoming & now seventy years or so later the investigator is confronted with the problems of trying to draw conclusions from the somewhat meager & contradictory body of evidence which exists on the subject & the problems are compounded by the fact that the Rectory is long gone & the changing landscape around its former site makes any form of empirical testing impossible. The major Borley books which have appeared since Harry Price first published The Most Haunted House in England in 1940 all have references to the phenomena of the lighted windows & the following is what can be concisely drawn from them. What becomes immediately apparent from looking through the literature is that the light seen in the Rectory windows was not restricted to the time of the Smith tenancy which was the period that the haunting became public knowledge. Price (1) mentions it being a common part of the phenomena experienced by the Bull family in their sixty-four year association from Henry D.E. Bull’s building of the Rectory in 1863 to Harry Bull’s death in the Blue Room in June 1927 after which time the place was left empty until the Rev. Guy Smith was inducted to the living in October 1928. However, the Foysters appear not to have seen it during the five years that they were resident at Borley, a period which ended in October 1935 & the phenomenon was only sporadically reported after they gave up the Borley living until the building was made un-inhabitable by the fire of February 1939. The last time that the light was seen was briefly during Harry Price’s tenancy of 1937-38 and then not by any of the official observers that he recruited. Two rooms in the Rectory, both on the first floor, were reported as having their windows mysteriously illuminated from time to time (See Fig. 3 of this essay & Sidney Glanville’s floor plan on p.22 of Price’s The Most Haunted House in England). These were Room No. 7 at the South-East corner of the original 1863 building which overlooked the lawn & Room No. 11 in the 1876 extension which was orientated principally to the South-West & overlooked & was closest to the Rectory Cottage. There is also mention that on one occasion when the light was seen during Price’s tenancy (in Room No. 11) it also appeared on the same night in the window over the main stairwell & was visible from the road opposite the Tithe Barn adjacent to Borley Place, both of which buildings still stand today. In Appendix C of his first Borley book, Harry Price makes the comment that it was the ‘strange light in the Rectory window that originally took me to Borley in June 1929’ (2). Mr. V.C. Wall, the Daily Mirror reporter who was sent to investigate following a request for help from the Rev. Smith & his wife, published the account concerning the light to which Price is referring in his newspaper on Tuesday 11th June & his account is reproduced by Price on pp. 3-4 of The Most Haunted House in England. Wall states that with a staff photographer he spent several hours watching & waiting ‘in the “haunted” [his quotes] wood at the back of Borley Rectory’ & both men saw a light shining through a window in a disused wing of the building. Harry Price qualifies the location of the light (p. 37 of MHH) as being in Room 7 on the first floor of the Rectory over the drawing room as noted above. Wall states that they could see the light ‘shining through the trees’ which indicates it was of a sufficient brightness to be seen at a distance, although it is not possible to state exactly how far away he was from the Rectory when he observed the light. 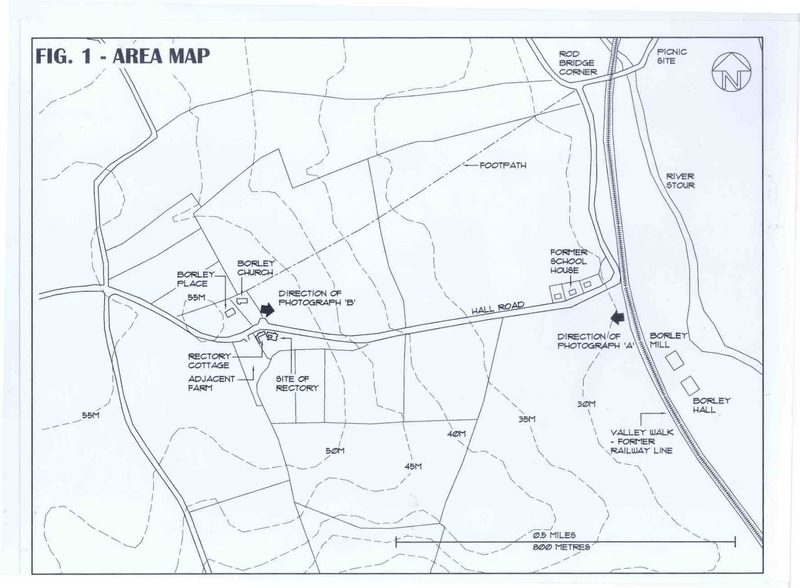 The site plan produced of the Rectory grounds by Sidney Glanville that Price published on p. 21 of The End of Borley Rectory (based undoubtedly on the 1933 Ordnance Survey map of Borley that Dingwall, Goldney & Hall reproduce in their 1956 report) although showing lines of trees, does not indicate the extent in any detail of the wood in which Mr. Wall held his vigil or its closeness to the Rectory building. From the contemporary photographs of the Rectory it is apparent that the lawn on which the Bull’s played croquet & tennis occupied a sizeable stretch of ground in front of the famous double gabled East side of the house, so it is likely that the wood in which the nun was said to have been seen & from which the Daily Mirror men saw the light was in the triangular section shown adjacent to the neighboring farm on the extreme South side of the Rectory grounds in Glanville’s drawing into which the West end of the Nun’s Walk disappeared. In order to get some sort of comparison, the Rev. Smith placed a lighted lamp in the window of an adjacent room (either No. 6 – the Blue Room – or No. 8 depending on which of the windows of Room No. 7 was illuminated as Price does not state which of the room’s two windows was seen to be lit up) & both the household light & the ‘mysterious’ light were visible together for an unstated period of time. As the two newspaper men approached the Rectory the apparently supernaturally produced light disappeared & the Rev. Smith’s oil lamp could be seen burning in the adjacent room. If Mr. Wall was sincere in what he wrote & reproduced the events as they actually happened that night, quite a lot can be gleaned from his article about the nature of the light seen at Borley Rectory during the incumbency of the Rev. Smith & his wife. As has been already noted, the illumination was bright enough for the men to notice it through the trees, which would indicate that it was a concentrated light source rather than some sort of glow or effect of moonlight. (Incidentally, the moon is only mentioned as a possible cause of the phenomenon of the lighted windows very briefly by the Rev. Henning in his pamphlet Haunted Borley, although Henning himself appears to have been inclined to accept a paranormal explanation for the lights. Not even the ultra-skeptical authors of the 1956 SPR report consider moonlight where the Borley lights are concerned). Wall’s account also suggests that the light was present, static & visible for some time & not just a brief flare or flash as might be caused by the headlights of a passing vehicle. The fact that the Rev. Smith was able to obtain a lighted oil lamp, go upstairs to a room adjacent to Room No. 7 & place the lamp near the window, after which both illuminations could then be seen together long enough for a comparison to be made clearly demonstrates this. Price’s quotation of Wall’s article gives no indication that Guy Smith actually accompanied the newspaper men out to the ‘haunted’ wood or spent any length of time there, only that at some point he was summoned to carry out the experiment with the oil lamp. However, Price omitted a short part of a sentence which Wall’s original article contained which does suggest that the Rector was with them for at least the period that the lighted window was observed (3). What is apparent when studying the incident as reported by Mr. Wall & its subsequent reproduction & commentary by Price is that both writers are unable to give much information on what was seen inside the building while the lighted window was being observed from outside. This is relevant in trying to pin down the actual nature of the light & how it appeared. When Wall states ‘on investigation of the deserted wing it was ascertained that there was no light inside – although the watchers outside could still see it shining through a window’ he gives the impression that the Rev. Smith went into Room No. 7 after he had placed the lamp in the adjacent room. There is no report on what the Rev. Smith experienced while he was in there, only that he didn’t find an ordinary explanation for the illumination and neither Wall or Price state whether the observers could see Smith in the room at the same time as the ‘strange light’ was visible from outside. In an ordinary situation someone inside a room lit from within would be visible as some form of silhouette from outside, but if this was not the case at Borley & the light obscured someone from being seen who was inside then the possibility of it being some form of external reflection or projection of light onto the window from an external source has to be taken seriously. But would not then that source be apparent to someone in the room? The above clearly illustrates the problems of trying to make sense of these curious events, difficulties which are compounded by them having taken place at a very considerable distance of time. Unfortunately Harry Price did not use his tenancy of the Rectory to carry out any experimentation into the matter of the lighted windows (a fact which did not escape the attention of the authors of The Haunting of Borley Rectory ) & by simply repeating the commentaries of others in continuing to call the phenomenon a ‘strange light’ did little to advance our knowledge of it today. Both Harry Price & subsequently Ivan Banks comment on the fact that the appearance of the light was a part of the phenomena experienced by the Bull family, presumably during the incumbencies of both Henry Bull & his son Harry as although both authors do not provide details of specific incidents, they comment that it was ‘reported by various people over a long period’ (5). Banks in his comments on the haunting during the Bull years appears simply to be repeating what Harry Price first laid down in The Most Haunted House in England as like Price he does not cite particular incidents. In Price’s Analysis of Phenomena (6), the witnesses to the lights in the Rectory windows during the years leading up to Guy Smith taking up the Borley living are the ‘many unnamed villagers’ as those others credited as having the experience are contemporary with the times of the Smiths & Alfred Henning. How frequent the light was seen during the times of the Bulls is impossible to tell with reference to the major Borley books. Even Trevor Hall in his chapter on the Bull incumbencies in The Haunting of Borley Rectory, a section of the report which was included to establish whether there was any real evidence for the Rectory’s ghostly reputation during the Bull years, does not make any reference to it, whereas other aspects of the case, such as the apparition of the nun & the footsteps inside the building, are examined in detail with several citations as to who saw what & when. Possibly Hall felt he had more than enough material with which to rubbish the haunting without having to include the matter of the light as well, or there was little actual material from surviving members of the Bull family to assess. Even then, his omission not to get one over on Harry Price by even a cursory remark as to the lack of evidence for this aspect of the haunting during the times of the Bulls is odd given the crusade with which he approached the case in general. Probably the most curious aspect of the light at Borley is its total lack of appearance during the five years that the Foysters were resident at the Rectory. I am unable to find a reference in any of the books published from 1940 onwards to it being seen by anyone after the Smiths moved out until November 1937 when Harry Price was renting the building. Believers in the phenomena of the Foyster period may be of the opinion that as the nature of the haunting changed with the advent of Marianne into a more violent & physical one, so the more passive aspects such as the light & the apparition of the nun became less strong. An important point to remember here is that those commentators who considered (and consider today) that external light sources were the cause of the lighted windows must have realized that these sources were still present during the five year occupancy of the Foysters when their supposed effects were not reported at all, either by the people living in the Rectory or the villagers of Borley who had apparently been reporting the phenomenon for a considerable time. Mrs. Mabel Smith apparently saw the light several times, often in company (the second time it appeared to her she was accompanied by the Borley church choir) & is credited as being in the habit of pointing out the phenomenon on occasion to the Borley locals. Mrs. Smith’s subsequent change of attitude to the Rectory hauntings is well known to Borley enthusiasts & her contributions to the list of possible non-supernatural causes of the lighted windows is discussed below. The other people listed by Harry Price who observed the light in the window are Mr. & Mrs. Basil Payne, the owners of Borley Place to whom Price introduced himself in the company of Ellic Howe on the occasion of their visit to the Rectory to set up the Base Room prior to the first observational period of his tenancy, and Mr. Herbert Mayes, the Rev. Henning’s gardener & chauffeur who also employed at the Rectory at some time by the Foysters. These witnesses stem from one of the last recorded appearances of the Borley light which was during the first six months that Price was renting the building. The Rev. Henning wrote to Price informing him that on the night of Monday 8th November 1937 Mr. & Mrs. Payne saw ‘a bright light’ in one of the Rectory windows which Henning qualifies as being in Room No. 11 in the 1876 extension (7). The authors of The Haunting of Borley Rectory feel that perhaps a window in Room No. 7 is meant here but Henning seems quite definite in his letter that the Payne’s were referring to Room No. 11. This appears to be the room which Mrs. Smith calls ‘the Schoolroom’ in one of the statements she made to the SPR trio in 1949 (see below). On the same night Mr. Mayes also saw the light but in the window over the main stairwell, presumably as he was walking along the road past the Rectory as this was the only vantage point from which it could be seen without going into the Rectory grounds, unless this is what he did. Apparently on the evening in question the building was not booked by any of Price’s official observers & was locked & empty, as was the case three days later when the Henning’s maid also saw the light. Its location this time on November 11th is uncertain as is the final reported incident of the light being seen at Borley, given by Price as November 15th with no indication as to who observed it (8). There is a possibility that Price may have made a mistake with the date in his Chronological List of Principle Events as Henning’s letter informing him of the light’s appearance was also dated November 15th, in which case the Rev. Henning’s maid may well have been the last person to see the ‘strange’ light at Borley Rectory. The explanations which have been put forward as non-supernatural causes to the lighted windows all involve some sort of reflection from mundane (primarily external) sources. In addition to those given in the various Borley books, the possibility of conscious trickery must also be included. The theories given are listed below with an indication as to which of the two rooms they are most likely to be relevant to. 1. Reflection from Passing Trains. This must have been given as an explanation to the light seen in Window No. 1 of Room No. 7 which overlooked the lawn & was the only window which faced towards the direction of the railway line to the East (Fig. 1 of this essay), half a mile away from the site of the Rectory. Mrs. Smith is quoted in The Haunting of Borley Rectory as having satisfied herself that this was the cause ‘after puzzling about it for a long time’ (9). 2. Reflections from Passing Vehicles. Underwood & Tabori mention this as having been suggested, although they don’t cite any particular person having put the theory forward (10). Again due to its orientation, Window No. 1 of Room No. 7 must be the window in question & the suggestion is that the headlights of cars approaching the Rectory corner up Hall Road would be visible to observers in the Rectory grounds. A modern suggestion has recently been made on the Borley website that the lights of the various motor coaches organized to see the ghost following the publicity of the case in the Daily Mirror could have been responsible for the lights seen. 3. Reflections from nearby Sudbury. This explanation is included in The Haunting of Borley Rectory & stems from a visit which Dr E.J. Dingwall paid to Borley during which time he spoke to a local farm worker who apparently told him this was one of the apparent causes of ‘them lights’ as he described them (11). Again the illuminations in Room No. 7 seem applicable here, but as Sudbury is two and a half miles from Borley, this explanation has to rank as the most wishful of given causes & even the redoubtable Mrs. Smith does not consider it. 4. Reflections of lights from the Rectory Cottage. As well as being considered as possible causes for amongst other things the footsteps heard in the Rectory & other auditory phenomena & as well as being taken on one occasion for the apparition of the spectral nun, Mr. Arbon together with his wife who were tenants of the Rectory Cottage & were entrusted by Harry Price with the keys to the building during his tenancy, are also suspected by the authors of the 1956 SPR report of providing suitable lights for the mysterious illumination of the windows of the Rectory, by its proximity those of Room No. 11 in the 1876 wing. Mr. Arbon is described by Dingwall, Goldney & Hall (referring to remarks made by the Rev. Henning) as being in the habit of leaving a lighted lantern in the courtyard at night (presumably while he also provided suitably ghostly noises by operating the water pump) & that a light from the Rectory Cottage caused a faint glow which was visible ‘in the window at the end of the south wing’ (12). 5. Reflections of lights inside the Rectory itself. Despite having come to the conclusion that the trains passing along the nearby railway line were (to her) the definite cause of the lighted windows & including this in a signed statement she made to the SPR trio in 1949, on being asked by Mollie Goldney to annotate copies of Price’s The Most Haunted House in England and The End of Borley Rectory with her comments as to the correctness of accounts given by Harry Price of events involving her at the Rectory, Mrs. Smith makes another statement to the effect that she also proved the effects to be caused by none other than ordinary lighting within the building. The authors of The Haunting of Borley Rectory publish this fact & make a comparison with the accounts of the light reported on by Mr. V.C. Wall which he saw during his vigil in the woods at the back of the Rectory which has been mentioned previously (13). It has to be mentioned that there is a conflict here as the second account by Mrs. Smith appears to refer to Room No. 11 while as we have seen, Mr. Wall was talking about the window(s) of Room No. 7. This anomaly will be clarified shortly but in general terms it has been suggested that oil lamps lit in the landing over the kitchen (on the North side of the Rectory) caused the illumination in the end room of the 1876 extension. 1. Reflections from External Sources. Even with the Rectory gone, a visit to Borley today will easily show what a prominent position it occupied in the locale of its time. Borley church is visible on the hill as one approaches the village from Rodbridge Corner after crossing over the River Stour & the Rectory cottage & the buildings which now occupy the site can been seen amongst the trees as one drives up Hall Road past the old Borley schoolhouse (See Fig. 1 & Photograph ‘A’). If Borley Rectory was still standing today it would no doubt continue to make the desired impression that Henry Bull wished when he built it in 1863. The main factor which must be taken into account when giving credence to the idea that the Borley light was caused by reflections from passing trains or vehicles is that in the days of the Bulls, the Smiths & the Foysters & during the whole of the time that Harry Price was a tenant, the Rectory was surrounded by tall mature trees, far more extensive than those present today, which would have made the initial approach to the site very different during those times than that which one gets when going there today. The photograph taken by Sidney Glanville from the tower of Borley church which Price reproduced on the Frontispiece of The Most Haunted House in England clearly shows how extensive the trees were & even during the winter months would still have provided a considerable screen around the Rectory grounds. Peter Underwood & Paul Tabori in their joint study of the Rectory haunting The Ghosts of Borley comment on the fact that the trees surrounding the Rectory site would of made it very difficult for any reflection to pass through to the Rectory itself, flagging up remarks made by Ghost Club member Mr. S.F.C. Kiernander. The North side of the Rectory garden, where the large summer house was situated, which formed a boundary along Hall Road appears according to Glanville’s site plan mentioned previously to have had trees for the whole of its length, which would have made it difficult for the window (marked No. 1 on Fig. 3) in Room No. 7 at the South-East corner of the building where the Borley light was seen extensively to have been seen by & therefore affected by the headlights of approaching cars coming up the hill towards the Rectory. The nearest that vehicles on Hall Road could have got to the South-East corner of the Rectory as they passed by would have been approximately 100 ft (30m). The other main contender as a normal explanation for the lighted window, the Sudbury to Long Melford railway line is just over half a mile (800m) east of the Rectory site which was elevated at least 80 ft (25m) from the line of the railway & as it passed Borley was situated in a partial cutting (Fig. 2). Some idea of the distance between the railway & the Rectory can be gleaned from the photographs reproduced here which I took on my recent visit & which Eddie Brazil has marked up with the course of the former railway line & the site of the Rectory. The concept of the railway being the cause of the Borley light, the conclusion that Mabel Smith came to as has been noted above, stands or falls on whether it appears possible that a moving train traveling at a considerable distance from Borley village could cause a bright light to appear in one particular window of the East elevation of the Rectory, a light which then appears for several minutes before disappearing & does not appear in any of the other windows on that side of the building which is what one would expect if the light source was moving & being projected across the side of the house. The intermittent appearance of the ‘strange’ light is also at odds with the source being a regularly run train service which by its nature would cause reflections to be seen at least several times a day in the evening or at night depending on the operation of the railway company. The rural location of the Rectory & the population of Borley being in the region of only a hundred or so people would obviously mean that the opportunities for regular reflections from the railway being seen would be less than if the house was located nearer to say Sudbury or Long Melford. However, during Harry Price’s tenancy which ran from May 1937 to May 1938, on most weekends & on days during the week, observers were present at the Rectory with instructions to spend at least an hour around sunset in the large summer house watching the garden & Nun’s Walk, a vantage point from which the window of Room No. 7 would have been readily visible & any regular reflections from the railway line easily seen. One of Price’s observers, Mark Kerr-Pearse spent a considerable amount of time at Borley, with at least one period of a whole week during which time he carried out long periods watching the Rectory & its grounds from the summer house, giving himself the reputation of being ‘an open air fiend’ as Price described him (14). Surely any lights from the railway would have been apparent to him during this time. At the time of writing Eddie Brazil is making enquiries into the running of the Long Melford to Sudbury railway in order to establish as much as possible how frequent the trains ran near to Borley & other associated factors, such as the speed with which they would have passed through the cutting at Rodbridge Corner & the illumination of the carriages & locomotive which are pertinent to the railway being a valid explanation of the phenomenon. His researches will form Part Two of this essay which will be added to the website in the near future. If the distance from the railway line to the Rectory is one of the factors which make it unlikely that passing trains caused the lighted windows, the idea that lights from Sudbury were responsible seems the most far fetched of the published explanations, although the authors of The Haunting of Borley Rectory did consider this worthy of inclusion in their chapter concerning the Price tenancy. The fact that Sudbury is two & a half miles away from Borley makes it highly unlikely that lights from any of its houses or buildings would have been able to cross this sort of distance & penetrate the trees surrounding the Rectory grounds effectively enough to cause a bright light to appear in any of the windows concerned, especially those of Room No. 11 & the main stairwell which were on the opposite side of the house from the town. My personal view on this explanation is that Dr. Dingwall read far too much into an idle comment of a Borley local more than likely tired with the reputation that the Rectory had obtained. Its inclusion in the SPR report seems to be in the vein of ‘more the merrier’ rather than a well considered & evaluated explanation. 2. Reflections from the Rectory Cottage. If photographs of the Rectory Cottage are examined it is apparent that several windows did overlook the West elevation of Borley Rectory, especially a double window on the first floor in the gabled section at the rear of the Cottage, although this was closest to the West wing of the Rectory (the Scullery & Rooms No. 1 & No. 2 ‘The Pear Room’ being the principle rooms at this end of the building) rather than Room No. 11 which was the room in which the light was reported on this side of the house. Given the close proximity of the Rectory Cottage & the fact that the absence of street-lighting would have made adjacent lights that much brighter & therefore visible, it has to be expected than some reflections would have been made in the windows of the Rectory which faced the Cottage by lamps lit by the Arbons’. This does not seem to be a suitable explanation for the light seen in Room No. 7 which was on the opposite side of the house & looked on to the garden. At this distance of time & with the Rectory gone it is impossible to say whether any reflections made by the Arbons’ in the Cottage would have caused the necessary bright light which was reported, and it seems difficult for this to have been the cause of the light seen in the window of the main stairwell by Herbert Mayes as this window was to the rear of the enclosed courtyard & farthest from the Cottage building. The comments already noted by the Rev. Henning concerning the fact that Mr. Arbon left an oil lamp burning in the courtyard while he used the hand pump in the covered passage at first seem a reasonable explanation for lights seen in Room No. 11 & over the main stairwell. 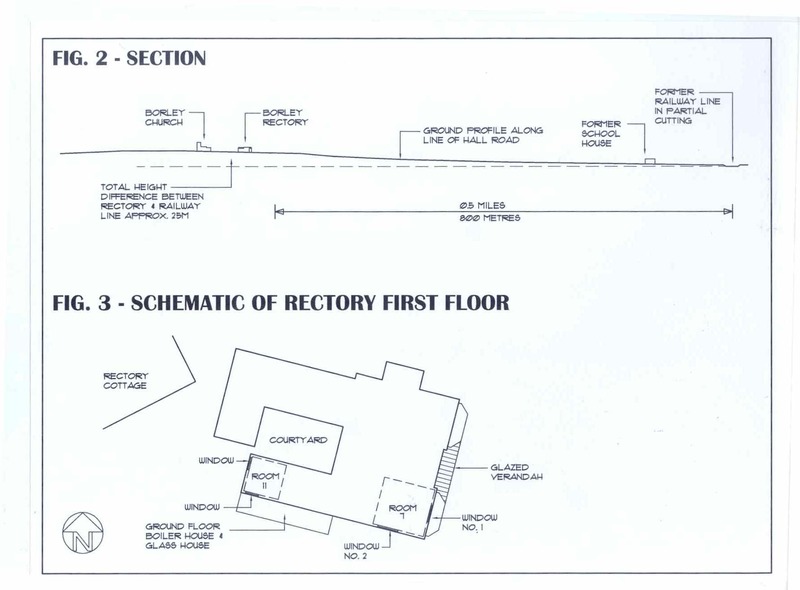 However, there are problems with this theory if the plan of the first floor of the Rectory is checked as it will be seen that there is no window in Room No. 11 overlooking the courtyard. The only way any light from a source in the courtyard could have filtered into Room No. 11 would have been through the window in the first floor extension corridor, providing that the door to Room No. 11 was left open. Incidentally, this window was omitted by Sidney Glanville in the plans which he prepared of the building & which were published by Price in both his Borley books. The floor plans which Ivan Banks produced for his book The Enigma of Borley Rectory corrected some discrepancies in Glanville’s drawings, one of which is the window referred to here. 3. Reflections from within the Rectory. In her statements to the SPR trio, Mabel Smith did not deny that she had seen a light in the window of Room No. 11 (as she did refute Harry Price’s statement that she had seen a figure leaning over one of the drive gates on several occasions) but offered the explanation that this light was caused by oil lamps lit in the first floor corridor over the downstairs kitchen passage which shone through the window opposite the servant’s stairs across the courtyard & through into the end room of the 1876 wing. As has been mentioned above in connection with Mr. Arbon’s lantern, this explanation would only work if the door to Room No. 11, the ‘Schoolroom’ as Mrs. Smith calls it, was left open & it certainly would not explain the bright light seen in Room No. 11 by Mr. & Mrs. Payne together with Herbert Mayes in 1937 when the Rectory was locked & empty. The authors of The Haunting of Borley Rectory make a comparison with the light as explained here by Mrs. Smith & that seen by Mr. Wall during his vigil in the wood in 1929. However by looking at the first floor plan of the Rectory is would seem very difficult for lamplight to make its way from a source located near the servant’s stairs across the main stairwell & through into Room No. 7 (again assuming the door to this room was left open as well) & be sufficiently bright to be visible to the two newspapermen outside. The object of this essay is not to champion any particular theory concerning the Rectory lights but to present what can be learnt about them from what has been published in the past sixty odd years. There can be no definite statement or conclusion about what caused the ‘mysterious’ light, only that both Eddie & I feel that several of the explanations given as its cause, particular that of trains on the nearby railway line, to be unsatisfactory. A vast amount of data & information exists about the history & happenings at Borley Rectory which makes it probably one of the best documented cases of its kind in the history of haunted houses. However, even here there are many pieces of the puzzle which are missing & people looking at the case today can only make judgments using the information which has been left for them. In his book Passion & Pain, the second part of a trilogy which tells a fictional but historically accurate biography of Ludwig van Beethoven, the broadcaster John Suchet presents the case for the identity of the great love of the composer’s life, known only as the ‘Eternally Beloved’, as being Antonie Brentano, the wife of a Frankfurt merchant to whom he dedicated his Diabelli Variations for piano. Suchet says that in his opinion, either Brentano was the lady in question or it was someone totally unknown about whom there is no information. This is a case which seems to reflect the situation one finds oneself in at Borley. Many things point to genuine paranormal phenomena having occurred at the Rectory over the years, but without the crucial evidence which does not exist today there will always be uncertainty. 1. The Most Haunted House in England by Harry Price, Longmans, 1940, p.51. 3. Mr. Wall’s original articles are reproduced complete on Vince O’Neil’s Borley Rectory website. 4. The Haunting of Borley Rectory by Eric J. Dingwall, Kathleen M. Goldney & Trevor H. Hall, Duckworth, 1956, p.139. 5. The Most Haunted House in England, p.51. 9. The Haunting of Borley Rectory, p.45. 10. The Ghosts of Borley – Annals of the Haunted Rectory by Peter Underwood & Paul Tabori, David & Charles, 1973, p.77. 11. The Haunting of Borley Rectory, p.139. 14. Letter from Harry Price to Sidney H. Glanville, 30th August 1937. Harry Price Collection, University of London.